If there was one word used to describe the Beech House in Bucks it would have to be ‘buzzing’. The atmosphere at Oakman Inns’ Beaconsfield venue is one of the best I’ve experienced yet, and not just because there was a 30-strong hen party enjoying a meal there at the time. Opening a bar-restaurant in Beaconsfield is a difficult balancing act, after all it is officially one of the most desirable places to live in the UK. Given that lofty status the town is also filled with a range of eateries and high class dining establishments and bars, so you have to get it right. 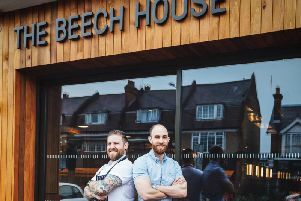 But Oakman - founded in nearby Tring in Herts - know a thing or two about that and the Beech House’s general manager James Stanton and his team have ensured it has become a destination venue for Beaconsfield and those visiting from wider Bucks, Herts and Beds. The premises has humble beginnings as it started life as a 1960s newsagent. It has been modernised in true Oakman style, though, to make it a vibrant and welcoming place to enjoy a few drinks after work or a family meal. Beech House is situated just around the corner from the train station making it easily accessible and that’s a good thing because after visiting once you’ll likely return as the food matches the atmosphere. Beech House has become known locally for its artisan coffee, local beers and charcoal-grilled Mediterranean-inspired cooking. After this visit I’ll remember it for the atmosphere, service and quality of the food. The Josper oven is not just a gimmick either. The enclosed, charcoal-fired grill allows head chef Andy Hampson and his staff to smoke, slow-cook and roast the most delicious and tender meats, fish and vegetables adding immense flavour to the dishes. The Saltimbocca Scotch Egg is a personal favourite, in fact it is so good you’ll wish you could have it for starter and main. The dish consists of soft-boiled free-range egg, sage, prosciutto, sausage meat and hollandaise. But then you would miss out on some other fine mains like the house burger which is a Josper-grilled Aubrey Allen British steak burger with mature Cheddar, smoked bacon, dill pickle, gem lettuce, red onion marmalade, tomato, ketchup and mustard mayonnaise. The calamari is another must-try served with yoghurt, the lemon and chilli marinated calamari comes deep fried and with a delicious chipotle mayonnaise. The desserts make life difficult for anyone with a sweet tooth, such is the choice on offer. The strawberry and raspberry mess is a crushed meringue with whipped vanilla cream, strawberry and a raspberry compote. But the star of the dessert menu is surely the toasted Belgian waffle with salted caramel ice cream and chocolate sauce. A succulent and soft pork belly roasted for 12 hours is another big shout but make sure you’re plenty hungry for this one. The food and atmosphere is right up there as is the service which is a credit to the pub-restaurant’s excellent team. But don’t just take my word for it, check out Beech House’s virtual tour online.